Larry Pointer, our Forrest Gump of the Conquistadors Car Club, marvels at Europe’s Golden Age of the coach built automobile, and influences that would ripple across the Atlantic Pond. From carrossieres to customizers, the distance is not so very far. Larry Pointer found himself a survivor of Y2K, retired, a widower, and a more or less empty nester. He needed a project. 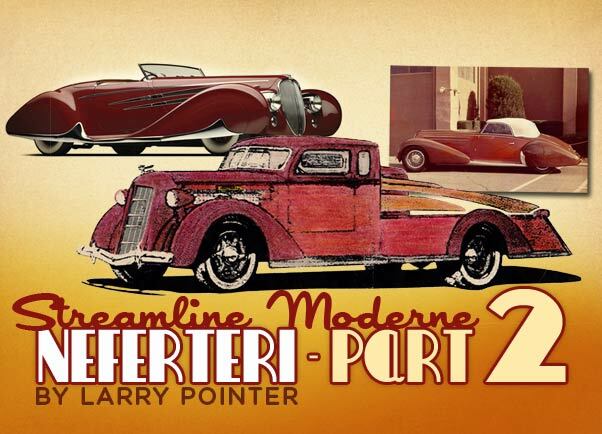 In this series, he shares his passion for all things “Streamline Moderne”, and how it all turned into a 13-year labor of love, to create “Neferteri“, his custom Diamond T truck. Streamline Moderne. In looking at Jack Juratovic‘s paintings titled Road & Track, November 1935, those images of the Milwaukee’s Hiawatha racing with the best of motor cars just define “streamline moderne“. Motion by design. Progress. And yes, Hope. The Great Depression, is search of better times. In the Grapes of Wrath bread basket turned Dust Bowl, bitter fruits indeed. Streams of jalopies looking nothing like streamline moderne were streaming out across the forbidding desert, laden with children and precious possessions salvaged from foreclosures, following the sunset to California, the land of milk and honey Promise. Lucky were the youth signed up with FDR’s public works programs; the Civilian Conservation Corps, repairing and re-building America, its infrastructure, its National Parks. Sending money earned with sinew and sweat back home, in promise of better times, “a chicken in every pot”. “Road & Track, November 1935, a painting by Jack Juratovic. In looking at Jack Juratovic’s paintings, and especially the one with the coach built Packard, we can’t but be impressed with just how Exotic it looks. A motor car like no other. Custom built. As in the exclusive shops of the European Continent. The pioneer coach builders, the “carrossieres”. 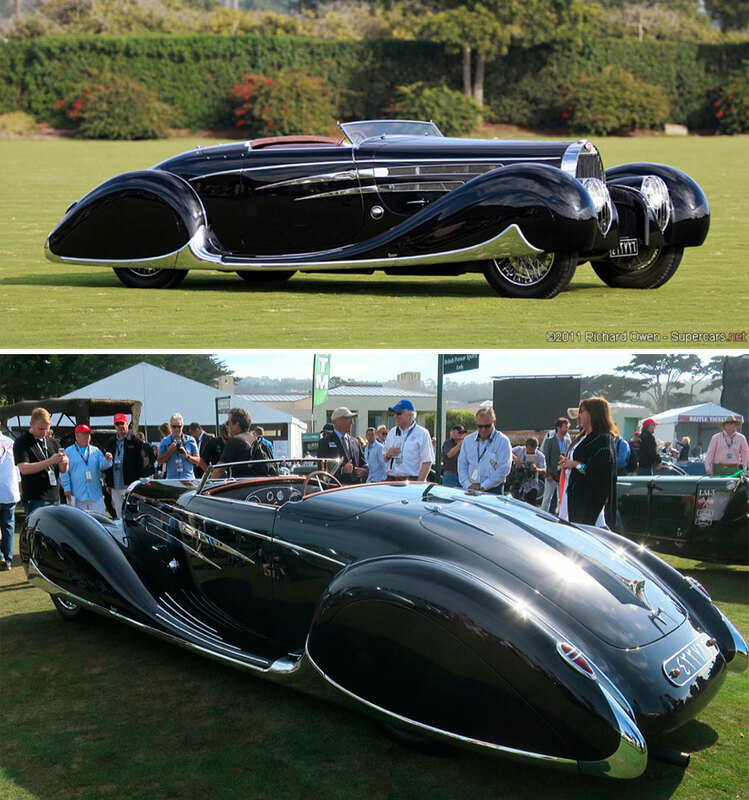 Today, we still can see the best of those one-off customs for the rich and famous, restored to their former grace and beauty or better, at Concours d’Elegance gatherings. At Pebble Beach each August. My own “Forrest Gump” connection to that ascot world would be much more humble, a bucket list visit to the Pebble Beach resort and golf course. Not in August when the classics rolled over the grass, but There, just to stroll around and imagine what I’d seen in after-the-fact magazines. Josephine Baker, Django Reinhart, the Lindy Hop and the Charleston. 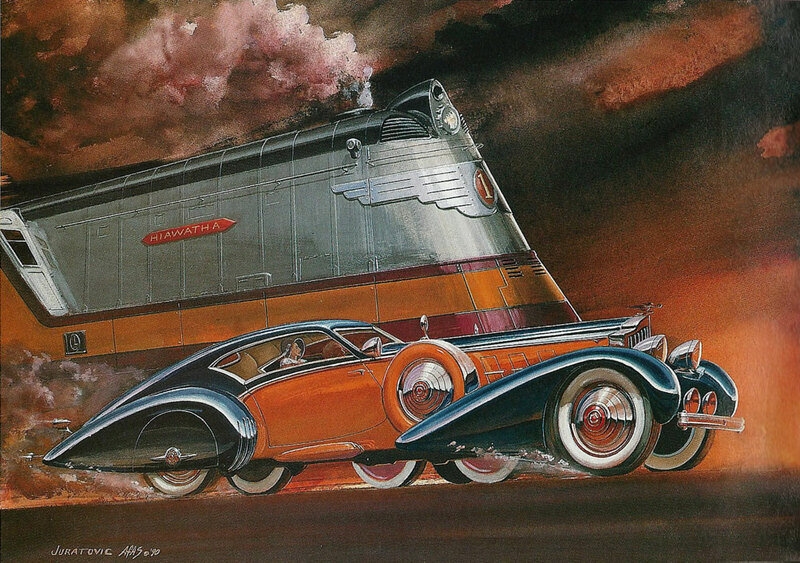 Sifting through images of the exquisite streamline moderne coach-built motor cars, it is a wonder so many have survived. Untold numbers were destroyed in the blitzkrieg of WWII. Others were sacrificed to the scrap drives to supply the War efforts. What comes through is that those of the privileged class, traveling in style on the Continent, were not stricken so much by the Great Depression that dragged America down. The night life flourished in Paris. Those who would drive up, or be driven up, to the cabaret night clubs and dance halls, could celebrate in lavish style, entertained by the exotic dancer Josephine Baker, or to dance the light fantastic to the Gypsy Swing of Django Reinhart. But it would be those custom made automobiles, custom made to individual taste by the exclusive coach builders, “carrossieres”, that would live to be celebrated long after those who “owned” them would slip away in the mists of time. That swoopy Packard in Jack Juratovic’s painting mirrors the best of the carrossieres of Europe, deep into the decade of the Thirties. 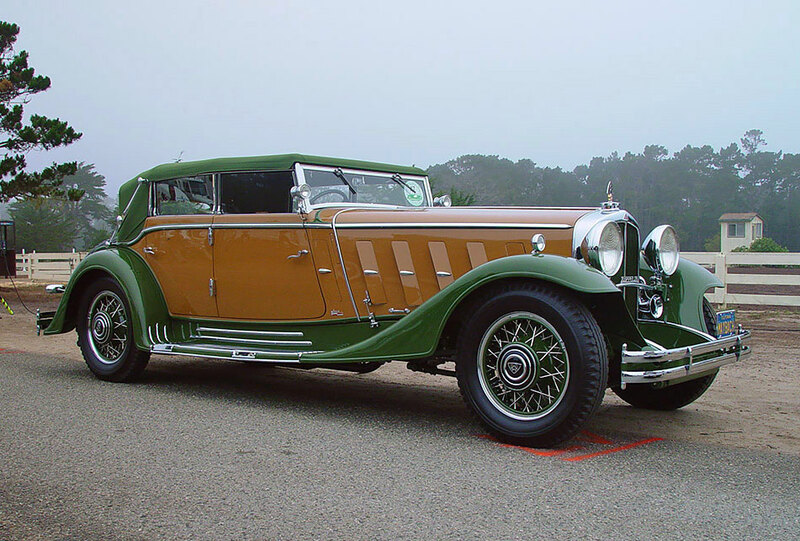 I could find a Delage, built by Letourneur and Marchand that had very similar lines. 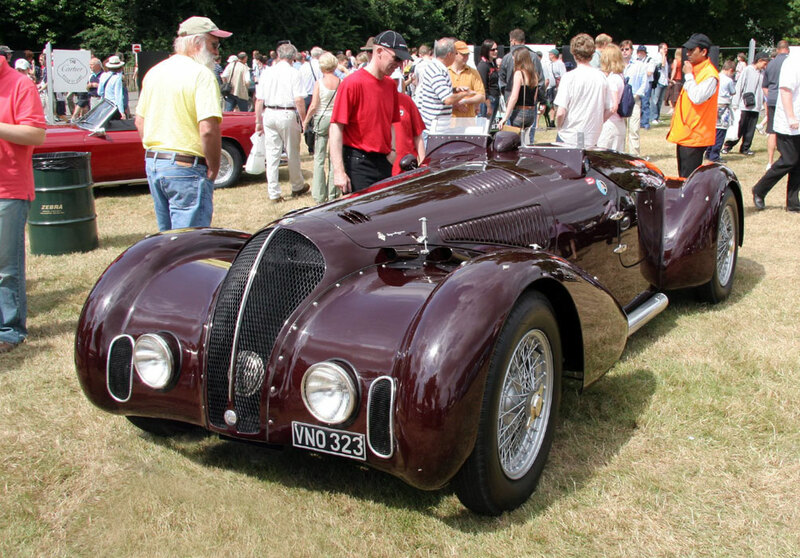 Figoni and Falaschi coachbuilt a 1937 Talbot Lago in that style. And a variety of Bugatti’s of the 57 base model from the same era compare well. A few more xamples of manufacturer cars of the Jazz Age. Imitation is the sincerest form of flattery. It is fun to pick out the similarities among the European coach built cars of that Jazz Age. They were found with a variety of badges, chassis from such makes as Alpha Romeo, Bugatti, Delage, Delahaye, Hispano-Suiza, Talbot Lago, even marque’s of American manufacturers, especially Duesenberg. The demands of high roller customers who wanted not just to “keep up with the Joneses”, but to out-Jones the Joneses, could explain repeating shapes and forms. Harry Westergard created this 1940 Mercury for Butler Rugard in the early 1940’s. 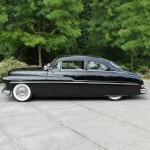 Back in America, we can look at the 1940 Mercury built by Harry Westergard and see in its styling, especially in the shape of the hood nose, definite echoes of those very European styling cues. 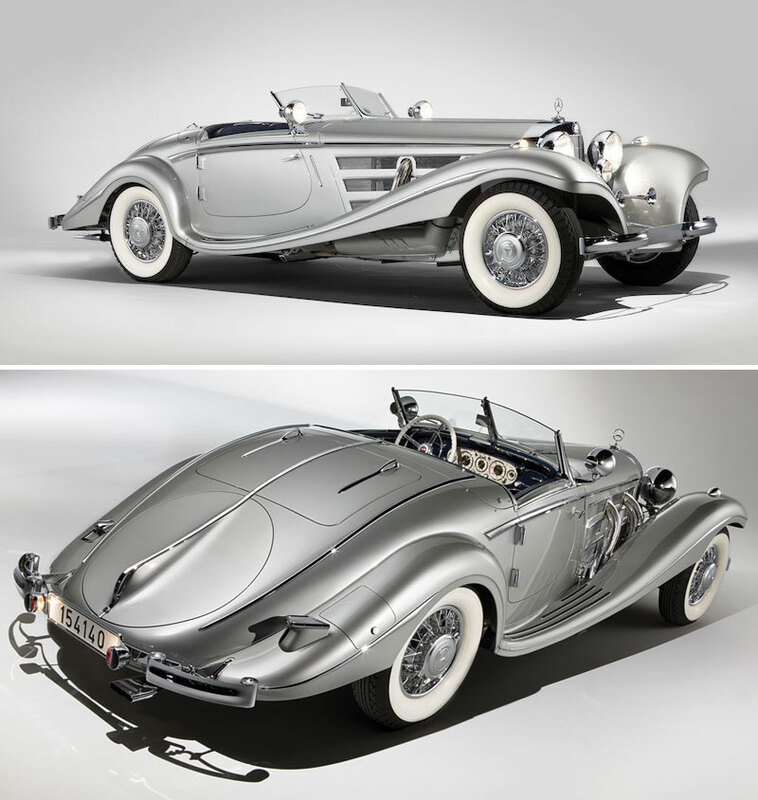 This car was invited to be shown at the prestigious Pebble Beach Concourse, among the few “seminal” customs of the traditional era deemed significant enough for such an unprecedented inclusion amongst the recognized classics. Similar style nosed as on the Westergard Merc can be found on these Coachbuilt cars. 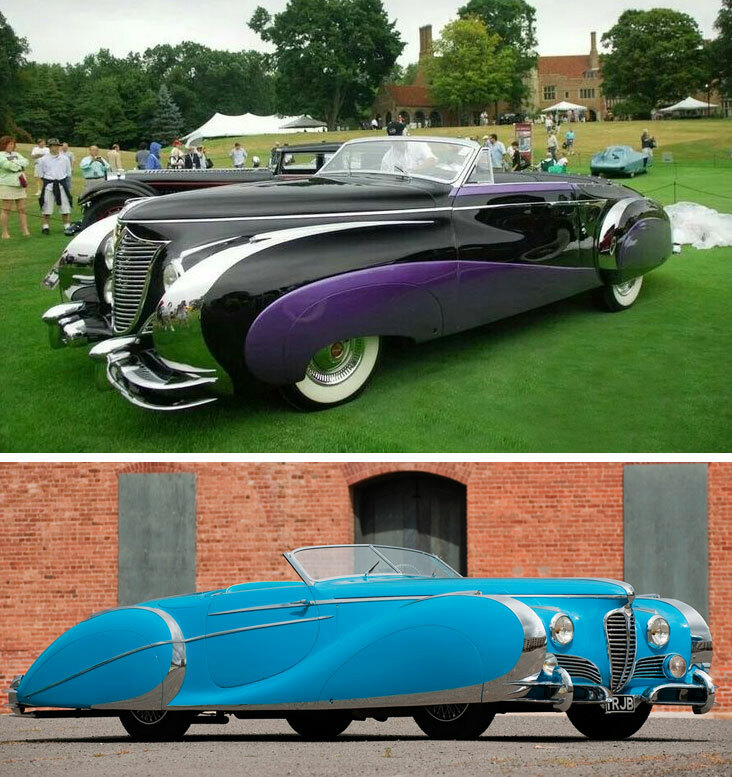 Saoutchik created this 1948 Cadillac in black and purple, and the brilliant blue 1949 Delahaye 175 S.
In studying the works of individual coach builders, there are recognizable distinctive signature shapes that can be identified. Saoutchik, especially, stands out, whether the base car was a Delahaye, or a later model Cadillac. Achille Van Vooren Bugatti for the Shah of Iran. But when the nation of France chose to honor the future Shah of Iran in 1939 on the occasion of his pending wedding, the Bugatti that was chosen first was delivered not to one of the most well remembered builders, but to Achille Van Vooren. The design executed by the Van Vooren coach builders, was based on that of Figoni and Falaschi, and originally meant for a Delahaye chassis. This car, today can be seen in the Peterson Museum, after narrowly escaping being scrapped in the aftermath of the collapse of the Shah’s regime. It has been considered among the very best examples extant of the coach built motor cars of the Continent. Who were those guys, the carrossieres, or in Italy the carrozzerias? 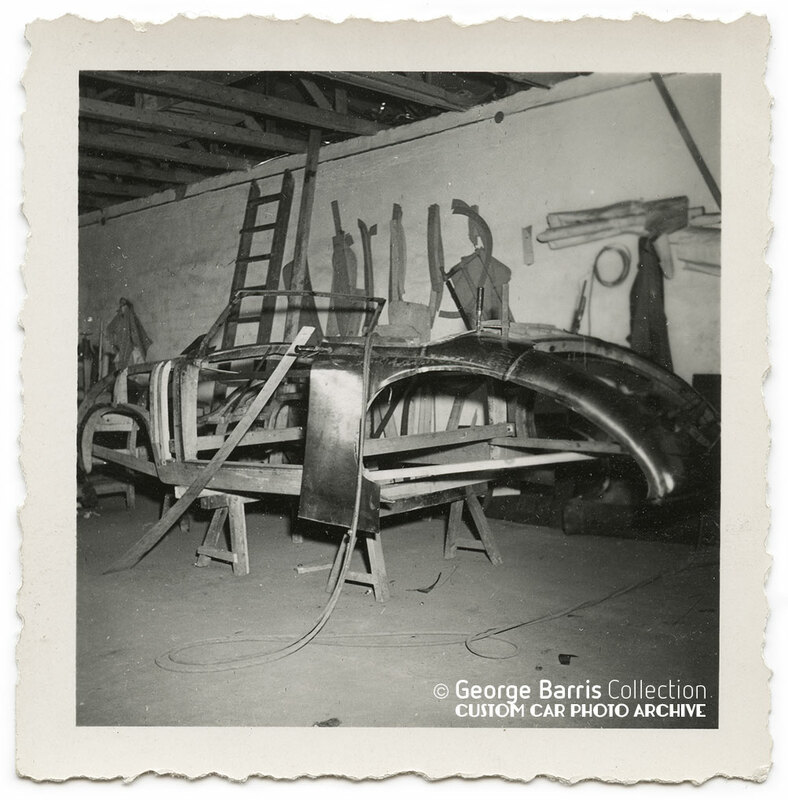 Coachbuild.com offers The Chachbuilders Encyclopedia, a biographical list of 104 coach builders. Ettore and son Jean Bugatti were designers in their own right. Others came up through the trade guilds that were rooted in the carriage and coach building industry of hay burning horsepower. Horsepower, and motor car racing, came to be a huge attraction and, with wins at Le Mans or the Mille Miglia, unequalled marketing power for the competing auto manufacturers. It was common practice, though, for construction of the car bodies to be contracted out to those in the coach building guilds. The basic body shapes were formed of hardwood, such as ash. Metal skins were hand formed. From the aircraft industry came pneumatic planishing tools, and the “English wheel”. Metal for fenders and various compound curves shapes also were hand formed over wooden bucks, to assure the three-dimensional results held true to the designer’s vision. Today, such masters as Marcel Delay and sons Luc and Marc carry on coach building, with time-honored practices and tooling that has stood the tests of time. Ron Covell not only offers enlightening magazine articles, but he and several other craftsmen put on workshops where those skills can be learned and developed. Figoni and Falaschi 1938 Delahaye. Figoni and Falaschi 1939 Delahaye. One of the most influential…and perhaps my own favorite…of those early master craftsmen, is Guiseppi Figoni, the designing force behind the Figoni and Falaschi coachwork. Figoni’s fascination with aircraft design following WWI led to aerodynamic elliptical shapes and “enclosed tear drop shaped fenders, which he called ‘enveloppantes.’” Those pontoon fenders, or in today’s street rodder speak, “fat fenders”, directly derive from the “wheel pants” of the streamline moderne airplanes. Out of the Figoni and Falaschi stable came Bugattis, Delages, Delahayes; “chassis-coachwork ensembles” in nitrocellulose lacquers a mile deep. These were long, low, swoopy cars with raked back windshields, flush frenched headlights, skirted fenders and “fluid grace and inherent motion”. Their “windswept designs” could blow your hair back, just standing still. 1932 Duesenberg by Letourneur and Marchand. My own inspiration followed the “I want to see it all” view. Earlier models from the end of the Roaring Twenties and into the Thirties also caught my eye. 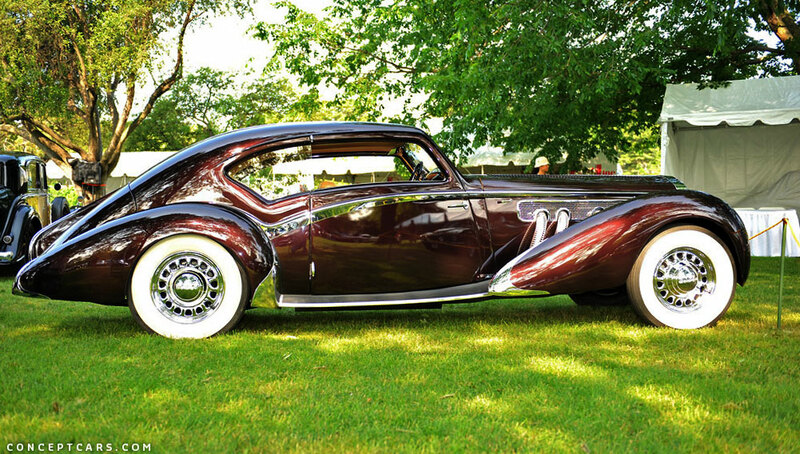 A Duesenberg by Letourneur and Marchand in the greater Paris area especially stood out. 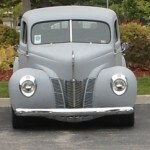 This was before fenders were skirted, or car trunks were integrated into the car body. But it was long and low, and just oozed of power. 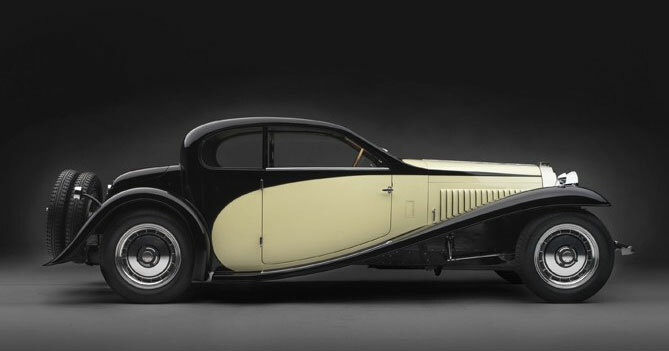 A Kellner bodied Bugatti of that early period also got my heart racing, as did the model 46 offered by Bugatti from 1929-1933. 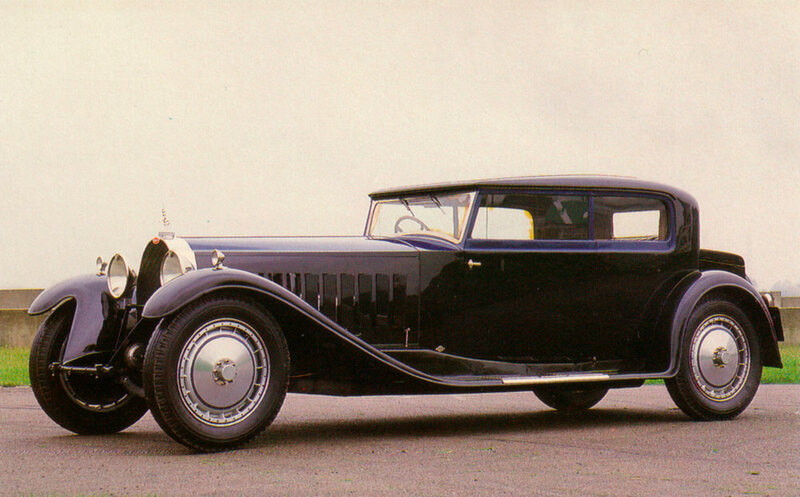 Kellner bodied Bugatti model 46 from 1929 – 1933. 1932 Bucciali with body by Saoutchik. The one to stop the heart of any “chop and channel” enthusiast of the hot rod fraternity has to be the 1932 Bucciali with body by Saoutchik. Out of Molsheim in the German Alsace a 1932 Maybach Zeppelin bodied by Hermann Spohn runs a close second in my album of dream cars of that era. No flammable dirigible there, and no lead Zeppelin, either. Then came the street rod to end all street rods. The Mercedes 540. A streamline dream. Designs that flowed out in body lines and curved contours. 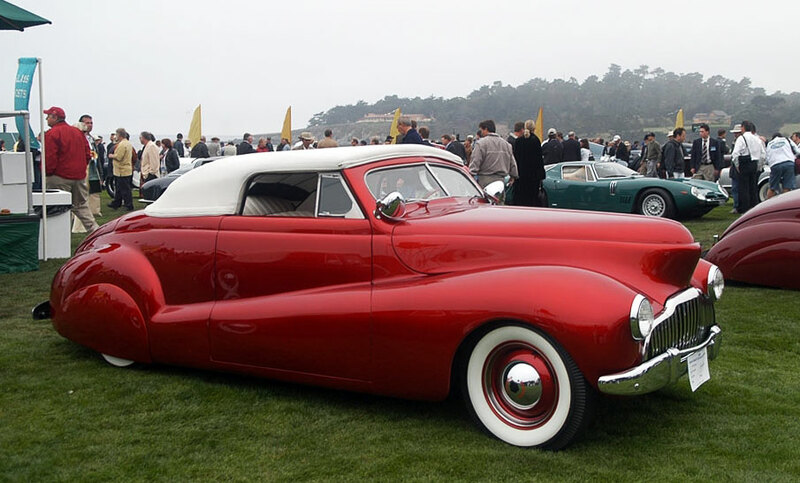 More recently, in 1952 Touring created a body sheath for a wine red Alpha Romero 6C roadster. Those Alpha Romeo roadsters put any hot rod into their rear view. 1934 Duesenberg Model J re-bodied around 1937 by Graber with an wonderful convertible body. These photos show the car with its new black and dark blue colors. But to close this Streamline Moderne page in my memory book, I have to share images of a Duesenberg bodied by Herman Graber in Switzerland. 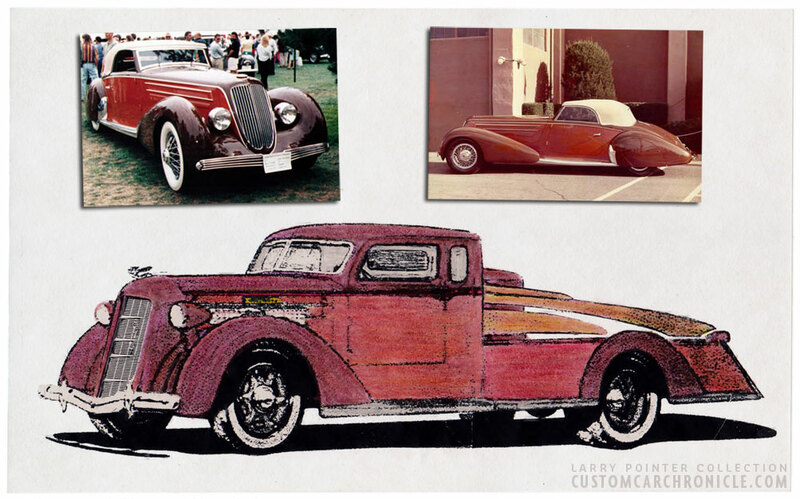 This American icon, coach-built by Graber, and painted THE color combination, wine and red orange, would inspire my drawing of Neferteri, my own streamline moderne dream. Originally the Graber Duesenberg J was painted wine and orange-red. My Diamond T Neferteri was based on the cars design, and colors. Next time, from Duesenbergs on the Continent to Duesenbergs back on home ground, and automotive design inspirations this side of the Pond. We’ll pack our bags with Howard “Dutch” Darrin and Count Alexis de Sakhnoffsky, and see what lay in store for me to closer to home (and my beer budget). 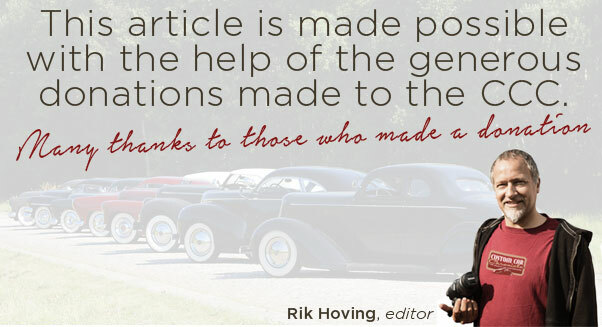 Larry Pointer is a fan of Rik Hoving and the Custom Car Chronicle. He was a member of the Conquistadors Car Club of Sheridan, Wyoming in the 1950s. 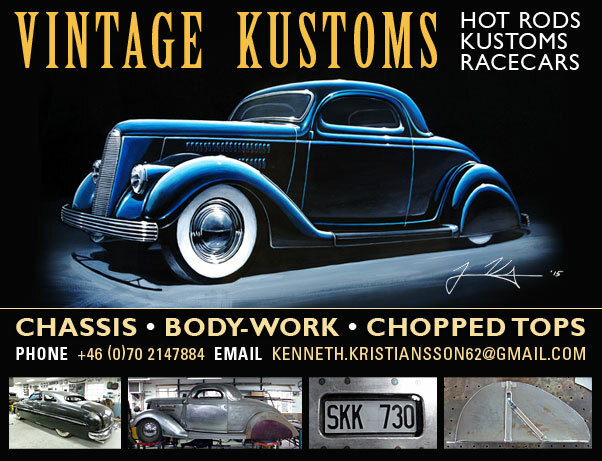 As he looks back over a lifetime of passion for the styling of the traditional custom car, he writes in tribute to those who influenced him, and for those who carry on the torch of passion. 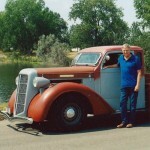 He is retired from the National Park Service, a former college instructor and rodeo advisor, author of western history, and now realizing his dream in building "Neferteri", a streamline moderne custom, based on a 1936 Diamond T truck. Wow, love this stuff. Thanks for putting this article together. Great research on your story. 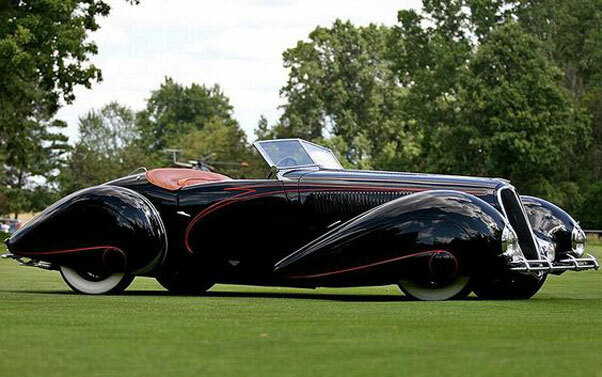 I have always liked the stylish lines and trim details on Delahayes! Have you ever seen the “Whatthehay”? It was at Barrett-Jackson last year? Had to look it up, Tom. And it was a beautiful example of Marcel Delay’s coachwork, for Boyd Coddington. Thanks for the heads-up. Great article Larry. Are you going to touch on the one attempt by an American manufacturer to mass produce a stream line car? The Chrysler Airflow. Stay tuned. I did add a DeSoto Airflow to the next installment. It was brought back to life by a friend in Casper, Neal Jacquot. Thanks for the great write up. This past January I was able to visit the Peterson Museum and see some of the cars you have pictures of. They were really nice to see in person. Pictures are great..but to see them in the flesh was fantastic.